2014 eFest to Feature RealFlight 7 Air Race Challenge! Home » New Release » 2014 eFest to Feature RealFlight 7 Air Race Challenge! competitions that will be of special interest to RealFlight flight simulator enthusiasts. The most talked about feature in RF7 — the latest edition of RealFlight — is Challenges. Many pilots describe these multilayered, game-like tests of skill as “powerfully addictive.” At eFest, one of those Challenges will come to life. At noon on Saturday, February 15, fliers can compete in an actual course based on one found in Level 10 of the RF7 Air Race 1 Challenge. Interested pilots should sign up at eFest on Saturday morning. 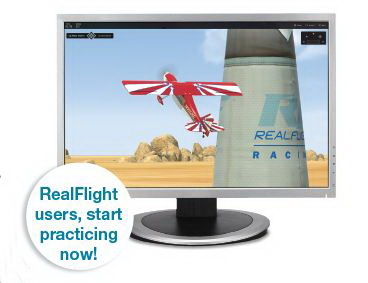 Be sure to prepare by practicing in advance on RealFlight! Another, new eFest competition will be an Air Race Challenge on RealFlight itself, to take place at the RF7 display located in the Hobbico booth. Forty-eight 5-minute simulator time slots will be available. Pilots can reserve theirs by signing up at the eFest registration area between 7:30 a.m. and 11:00 a.m. on Saturday. The Challenge itself will begin at 1:00 p.m., and the winning pilot’s name will be announced at 3:00 p.m. The prize is a free copy of RF7.